I hope you like tentacles and eyeballs, because the next Hearthstone expansion is absolutely lousy with them. As internet sleuths deduced earlier this week, the new set is called Whispers of the Old Gods, and it’s themed around the menace posed by four eldritch deities chained deep below Azeroth. Whispers of the Old Gods is due late April/early May, which is a little later than expected given the current staleness of the metagame, and the set's release will coincide with the arrival of Hearthstone’s Standard format. 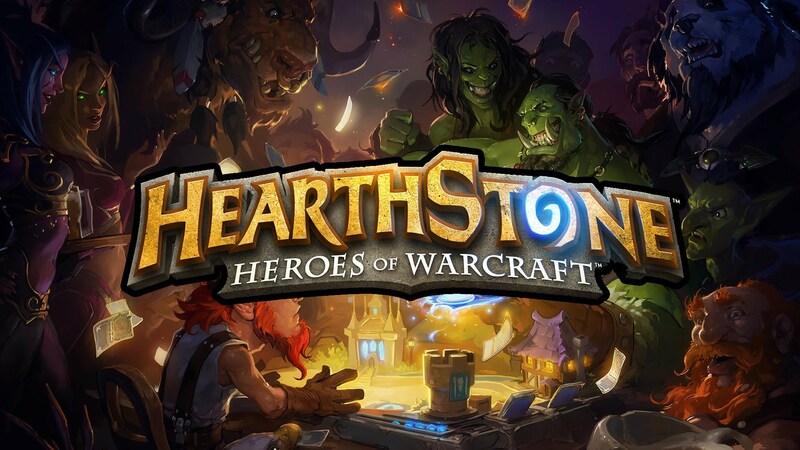 In the meantime, next week will see a patch to the Hearthstone client that adds nine new deck slots and gives players a preview of how the user interface will change for the Standard/Wild split. The Whispers of the Old Gods set contains 134 new cards, and Blizzard plans to give each player who logs in during the launch period three packs for free. Additionally, all players will receive the Legendary card C’Thun, which is one of the titular Old Gods, and two Beckoner Of Evil cards. There’s a reason for that generosity, besides Blizzard wanting to have anOprah moment. Without C’Thun you wouldn’t be able to enjoy the card’s unique mechanic, which synergises with 16 other “cultist” cards in the new set. When you play a cultist, like Beckoner of Evil, it adds a stat buff to C’Thun, regardless of where C’Thun currently is (i.e. it could be in your hand, on the board, or hiding somewhere in your deck). Each time that happens both players are able to see, via a sweet portal effect, how big C’Thun currently is. The idea being that the longer the game goes, the more ominous C’Thun’s arrival becomes. Which matters because although he starts out as a measly 6/6, C’Thun’s Battlecry is “Deal damage equal to this minion’s Attack randomly split among all enemies”, so the potential impact is huge if you’ve buffed him to, say, 15/15. The caveat to that is of course that C’Thun is expensive at 10 mana, you can only run one of him, and you also have to include a bunch of cultists to make him worthwhile. But having played half a dozen games with him, I can safely say he’s a lot of fun and the first few weeks of Old Gods is going to see pretty much everyone trying to make a C’Thun deck work. The cultists we saw had decent stats, so there isn’t too much drawback to including them. C’Thun feels like he’s going to work best in decks which are able to last long enough to have his Battlecry get crazy value. I spoke to a number of pro players and casters at the hands-on event, who gave me their initial verdict on the card. The idea of using Conceal and Shadowstep in C’Thun Rogue already sounds disgusting. Hearthstone’s lead designer told us that the other three Old Gods—Yogg-Saron, N'Zoth and Y'Shaarj to their friends—don’t use mechanics as complicated as C’Thun’s, but are all the kind of cards which deck archetypes can be built around. Brode also confirmed that none of the new cards will feature The Grand Tournament’s unloved Inspire keyword, and that the planned balance changes to problematic Classic cards won’t be announced until just before the launch of Standard and Whispers of the Old Gods. His reasoning was that letting players know which cards are changing far ahead of time would only exacerbate the frustration felt when you lose to a card you know is going to be nerfed. Yesterday we asked team Tempo Storm’s founder Andrey “Reynad” Yanyuk to predict which cards will be changed and how, which you can check out here. A significant chunk of the other new minions in Whispers of the Old Gods will be “corrupted” versions of cards found in the current sets. There are three ways these bizarro minions work. Some effectively double down on what the original card did. So, the Polluted Hoarder is a meatier version of its little brother, with a 4/2 statline for 4-mana cost, but the same Deathrattle effect. Others are more like “evil twin” versions, so the Corrupted Healbot is a 6/6 whose Deathrattle heals the enemy hero for 8. A bit like a Zombie Chow on Steroids. The coolest twists, though, are the ones which riff on an old card’s concept. For example, Validated Doomsayer is smug that the world really is ending. He’s still a 0/7, but now costs 5 mana and at the start of the next turn his Attack stat becomes 7. Which, it turns out, is a tough card for your opponent to deal with when you Coin-Innervate it on turn two. The new cards are available to pre-order now, with the usual one-time discount of $49.99 for a 50-pack bundle, and an accompanying card back for throwing your cash down early. We’ll have tons more coverage of Whispers of the Old Gods in the run-up to release, including a full interview with Ben Brode. For now, I expect most players will be focused on the fact they're getting a Legendary for free and starting to theorycraft obnoxious combos for it. “You get a C’Thun, and you get a C’Thun…” Let us know what you cook up in the comments, and if you want to see the current state of top level Hearthstone, check out the Winter Americas Championship which just started on Twitch, and runs through to Sunday 13 March.